Poisonings and medicine mishaps can happen to anyone, regardless of age. While approximately half of the cases managed by poison centers in 2016 involved children, many of the more serious poisoning cases involved teens, adults, and older adults. By taking a few precautions, you can help keep you and your loved ones of any age poison-safe! Children act fast! It takes only seconds for a child to get a hold of something dangerous. Keep potentially dangerous substances like medicines, cleaning and laundry products, pesticides, button batteries, and others stored up, away and out of sight! 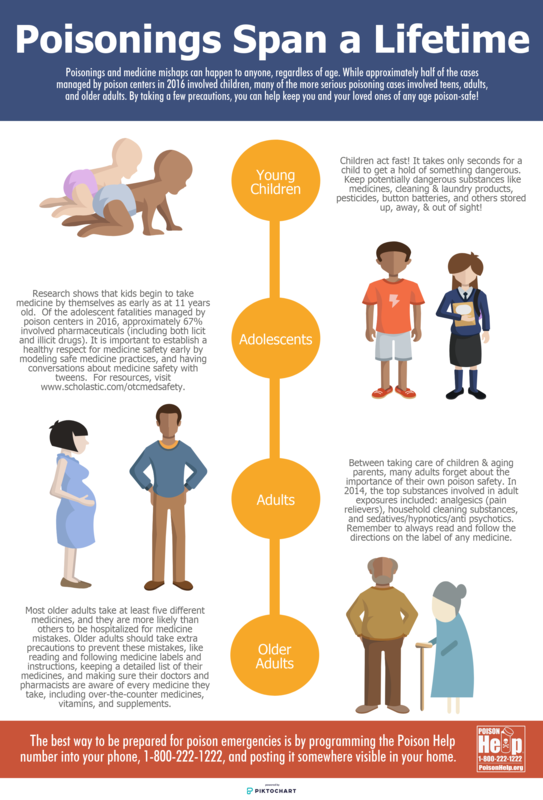 Research shows that kids begin to take medicine by themselves as early as at 11 years old. Of the adolescent fatalities managed by poison centers in 2016, approximately 67 percent involved pharmaceuticals (including both licit and illicit drugs). It is important to establish a healthy respect for medicine safety early by modeling safe medicine practices, and having conversations about medicine safety with tweens. Between taking care of children and aging parents, many adults forget about the importance of their own poison safety. In 2014, the top substances involved in adult exposures included: analgesics (pain relievers), household cleaning substances, and sedatives/hypnotics/anti-psychotics. Remember to always read and follow the directions on the label of any medicine. Most older adults take at least five different medicines, and they are more likely than others to be hospitalized for medicine mistakes. Older adults should take extra precautions to prevent these mistakes, like reading and following medicine labels and instructions, keeping a detailed list of their medicines, and making sure their doctors and pharmacists are aware of every medicine they take, including over-the-counter medicines, vitamins and supplements. The best way to be prepared for poison emergencies is by programming the Poison Help number into your phone, 1-800-222-1222, and posting it somewhere visible in your home. This information is also available in a downloadable format.